Good news for vinyl fans and collectors: Herb Alpert’s highly acclaimed new album, Come Fly With Me, is now available on 180 gram vinyl! Release date is set for Friday, Nov. 20. You can order a copy of the 180 gram vinyl version from Amazon, or pick it up at your favorite local vinyl retailer. 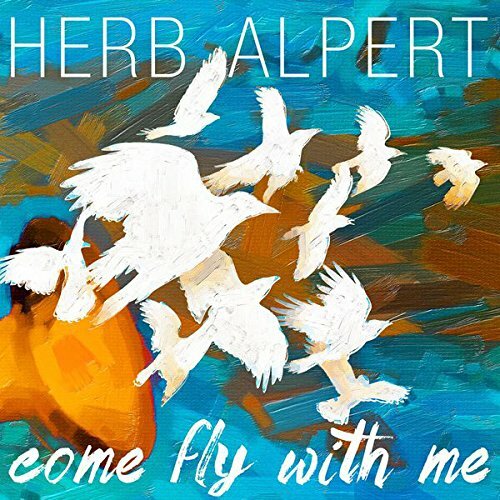 Featuring his long-time combo, along with some other familiar names, Herb Alpert has released his latest album, Come Fly With Me, on CD and digital download, with vinyl to follow at a later date. The CD, MP3 download and 180 gram vinyl may be ordered through Amazon, and downloads are also available via iTunes. (Click through the links to purchase. Join our forum discussion here. Enjoy this early, rare Herbie Alpert single! Written and produced by Herb Alpert and Lou Adler. An ongoing issue, further complicated by some countries’ copyright laws, has led to ongoing piracy of Herb Alpert’s recordings. Just as a reminder, going forward, there is only one official label which produces Herb Alpert’s recordings: Herb Alpert Presents. Aside from Definitive Hits, A&M no longer distributes Herb Alpert’s recordings. The deal with Shout!Factory has also expired, so all that remains are the few albums remaining in stock in the Signature Series. Any other releases from countries outside the United States are unauthorized, unofficial, and not approved by Herb Alpert Presents. In other words, they are pirated recordings. Quality and sources are questionable–they might be recycled from existing CDs, or made from poorly-transferred needle drops. For genuine product, buy from reputable sellers, or buy used products of known good quality from sites like Discogs, eBay, and other outlets. If you own, or are thinking of purchasing, any item that you are uncertain is legitimate, please stop by our Herb Alpert Forum “piracy” thread to inquire as to whether or not your chosen release is indeed legitimate, or not. We are not only helping the artist protect his copyright, we are also helping prevent users from being burned by sub-par products. Here is another rarity for our readers: “Viper’s Blues,” credited to Herbie Alpert and His Quartet, on the Carol Records label. Due to this site’s new WordPress format, we have taken our full discographies offline. For now, we have a short “at-a-glance” discography in our left sidebar. With current availability and future releases in an uncertain status at the moment, we will return with our new and improved discography pages late in the year, complete with purchasing links so that you may more easily locate those recordings you’ve been searching for. Check back often! Kudos to Randy Badazz! We look forward to more upcoming news from Herb Alpert! Herb Alpert has sold more than 72 million albums worldwide as a musician and bandleader of the groundbreaking Tijuana Brass. He has won seven Grammy Awards, including Record of the Year for “A Taste of Honey,” and had three of his recordings–the early TJB hit “Whipped Cream,” 1966’s “What Now My Love,” and his 1979 solo hit “Rise”–honored with inclusion in the Grammy Awards Archive Collection. Beware of new Herb Alpert CD releases! We have had a few of our TJB Forum members point out a rash of CD releases showing up on eBay that claim to be “official” CDs. If you want to know what is officially and legally in print, check out our availability thread in the forum. From what our users are saying in this forum thread, these “official” CDs are made from needle drops. Just a reminder to everyone: Herb Alpert owns and controls his master tapes, so any official Herb Alpert and Tijuana Brass products would not be released without his approval in any country. A&M Records is no longer involved in Alpert’s recordings.